I was never really a cheese person. I mean, c’mon. I’m Malaysian. Not French. Not Italian. Up until I was in my mid teens, the only cheese I ever knew was the type that came singly wrapped in plastic. And it wobbled when you shook it. (And again, for effect) Wobbled. We would, on occasion have some sort of grated yellow on a lasagn-esque meal. And I’d tried the grated yellow powder on my pasta at the Pizza Hut all-you-can-eat buffet, but found it, well, a little nasty. Oh, and up until a little while ago, lactose played havoc with my body. So no cheese for me. And then, one otherwise unmemorable day, I had some brie. I think I took it for politeness’ sake. “Some brie for you?” “Oh, er, sure. Thanks.” And all of a sudden, there was this sweet yet salty, creamy, bitey flavour permeating my unaccustomed tastebuds. “Ohâ€¦ Heyâ€¦ Yum!” And so it began. Now, by all accounts, cheese can be a tricky pain-in-the-behind to make at home. It often involves tricky-to-find ingredients. Like rennet. It can also involve spending long periods of time waiting. And waiting. And waiting. So I’ve started simple. 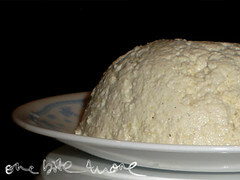 With a “ricotta”. Inverted commas because it isn’t really a ricotta, but can be used in lieu of one. 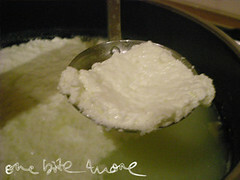 Ricotta, you see, is made from the whey (as in curds and whey a la Little Miss Muffet) that is poured off when making other cheeses, like mozzarella. 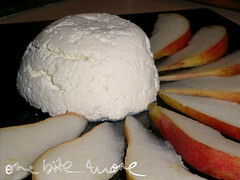 Because it’s made from the run-off, the yield for ricotta is fairly low. I am not the type to deal with low yield. So a cheat’s version it is! And simple too. Oh, so simple. I’ve made two versions. One plain, one beautifully (and tastily) spiced. Recipes used here are adapted from 101 Cookbooks. 1. First things first. Make sure you have everything that you’ll need. 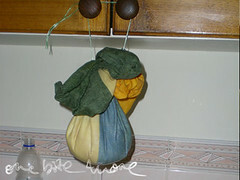 This will save you much panic later when you are running around your kitchen, dripping teatowel in hand, yelling “String! I need some string!” and causing yourself to grey prematurely. 2. Got it all? Good. 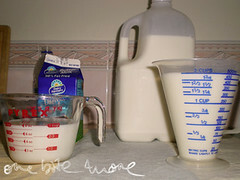 Now tip your milk, buttermilk and just a pinch of salt into your pot and heat gently. Stick your finger in and taste it. This is how your cheese will taste. So if you like a saltier ricotta, add a touch more. 3. 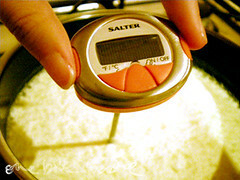 Heat the mixture slowly. It will, for a while yet, look like nothing is happening. But keep with it. And stir gently, scraping along the bottom from time to time. 4. Check the temperature. Still nothing? That’s ok. Because when it hits 65C, you’ll suddenly notice that your liquid is thinner and lumpier than before. Keep stirring though. That’s right. Stir Stir STIR! 5. The curds will now be coming together and becoming more prominent. Is it time yet? No. You have to wait until the temperature-hits-80C-and-almost-there-wait-and-YES! Turn the stove off and let it sit for five minutes while you prepare for the next step. 6. Here’s where you set up your straining device. Place a sieve over a bowl. Now line said sieve with a tea towel or men’s hanky. Why the gender discrimination? Men’s hankies are bigger. Ok? Ok.
7. Using your normal ladle, carefully press down on the surface of the cheese – you don’t want to break the layer, you just want to collect the liquid it’s sitting in so you can discard it. If you’re a deft hand, you can try to carefully pour the liquid out of the pot here. I’m not a deft hand. Not at all. 8. Got most of that liquid out? Good. 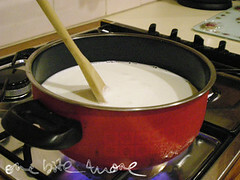 Now using your ladle-with-holes-in-it, slowly scoop up the curds and place them in your straining device. Keep going until you’ve caught all the curds. (Hint for the uninitiated: curds = lumpy white bits that will form your cheese). This will get hard near the bottom, so try draining as much of the liquid off as you can again and then going for the last few floaty bits. 9. 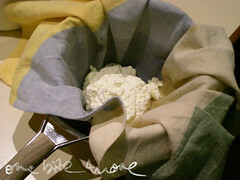 Grab the corners of your tea towel / hanky and pull them together to form a cheese-containing sack. Tie around the middle like a Christmas Pudding and hang it over the bowl from a convenient height. I used my cupboard handles for this job. 10. Drain the cheese for about 10 minutes, or until the tea towel stops dripping profusely. When you open it up, you’ll see a mass of cheese inside. Hoorah! Carefully group it together with your hands and place it in a container to cool. As an optional extra, use a teacup to mould your cheese into a nice little shape before packing it up. Just try not to push down too much, as this will squeeze the moisture out of the cheese and make it hard. 11. Voila! You now have a lovely curdy cheese for eating with pears on toast. 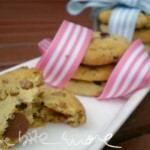 Or, for using in one of a number of recipes, some of which will be posted here, and soon! 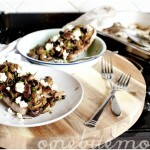 cheese and pears – yummo! All you need to do is add Â¼ tsp mixed spice and the zest of a lemon in with your milks in step 2. 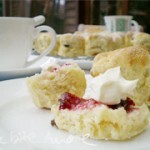 This version is lovely and fragrant, without being sweet. Recipes using this mixture include one times deliciously moist cake. Coming soon. i’ve had ricotta a few times- only on some hospital vegetable lasagne. .. it was nice! Looks delicious! I don’t cook with ricotta much, but actually quite like baked ricotta. I haven’t eaten plastic wrapped singles in awhile, but they’ll always hold a special place in my heart, because I loved them as a kid. That, and laughing cow cheese! Bravo! I am so impressed you made your own cheese! I’ve sometime contemplated it but then thought “Oh no, too hard” but it looks quite straightforward thanks to your action shots. Hey! Great start to your back to basic series. This looks oh-so-easy to do for those time when I want to make ricotta filling during the wee hours of the morning and I have a reasonable surplus of milk. Hee hee ladle-with-holes-in-it hee hee and are you saying men are snottier than women so they have bigger hankies 0_o? YAYY!! for chheessee though and you make it look/sound so easy! Lorraine: i had similar feelings. it’s not hard at all – and it’s even easier the second time around, so give it a couple of shots. Simon: not as odd as you think. we somehow ended up with 6L of milk in the fridge after a miscommunication last weekend and actually had something to do with it for a change. hmmm yes! Steph: thanks so much! good luck with the cheese making! Thanks for sharing, I’m very impressed at how you made it. How long will it last in the fridge (if for some crazy reason it doesn’t all get eaten 🙂 ? This is great! You’ve made it look so beautifully simple, and even found something to hang the draining cheese from (I’ve been thinking about this retort stand issue!). I’ll have to give this a go. wow top stuff, making your own cheese. 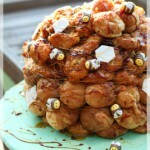 I love that dripping device, reminds me of the DIY version my mum uses for making home made soy bean milk!